By definition an agile team has a high amount of daily interaction. 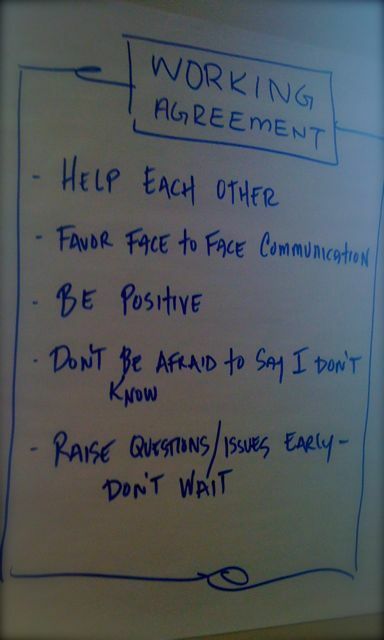 This brings out a need to establish some common set of rules that all team members abide by. This is a simple document which can be changed every iteration or sprint or necessary. Anything goes here that all developers agree. 2) Time of stand up. This document is visited every interation and changes are made. This is one of the visible indicators that should be in the area where the teams are working. Address any issues to the correct party (at the right time). Use sticky note on monitor, email, phone call, etc. Test Driven Development is a requirement for the project. Don’t break the CI build!